We’re closing in on opening night of Star Wars: The Force Awakens, so that means Disney is going H.A.M. on the marketing opportunities. In their next move, they have partnered with Verizon and Google to release a set of special edition Google Cardboard viewers that have been designed after characters in the new Star Wars flick. The viewers arrive tomorrow (December 2) at Verizon stores. Below, you can see the fronts of the four that will be available. You have BB-8, R2-D2, Kylo Ren, and a Stormtrooper themed viewer. 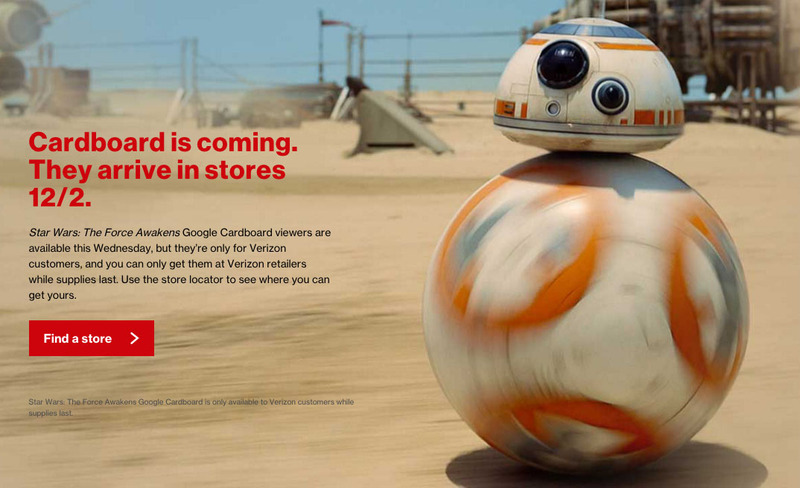 To get a better 3D view of each and to see where you can find a store carrying the special edition Cardboard viewers, hit up Verizon’s site.